Read the new book Fortune’s Formula: The Untold Story of the Scientific Betting System That Beat the Casinos and Wall Street by William Poundstone. What do money management and data transmission over phone lines have in common? Uncertainty. If a gambler places bets on the input symbol to a communication channel and bets his money in the same proportion each time a particular symbol is received, his capital will grow (or shrink) exponentially. If the odds are consistent with the probabilities of occurrence of the transmitted symbols (i.e., equal to their reciprocals), the maximum value of this exponential rate of growth will be equal to the rate of transmission of information. If the odds are not fair, i.e., not consistent with the transmitted symbol probabilities but consistent with some other set of probabilities, the maximum exponential rate of growth will be larger than it would have been with no channel by an amount equal to the rate of transmission of information. The formula has come to be simply known as the Kelly formula and it was great inspiration to great trend traders and systems traders. They were inspired directly by Bell Labs research to develop systems centered around determining the optimal bet size (otherwise known as money management). What is the Kelly criterion (or formula)? It is a formula for calculating how much to bet. It assumes that your objective is long term capital growth (getting rich). The handicapper’s choice of money management strategy is similar to the stock market choice between growth stocks and income stocks. Growth stocks tend to be more volatile, but in the long term return more profit. That is because the profits from growth stocks are reinvested rather than skimmed off. Every reinvestment is a calculated risk. Therefore, income stocks tend to fluctuate in value less, but also return less profit in the long term. Kelly betting is for growth. It reinvests profits, and thus puts them at risk. If your objective is to make small but consistent profits,it may be too aggressive a money management scheme. Kelly % = percentage of capital to be put into a single trade. W = Historical winning percentage of a trading system. R = Historical Average Win/Loss ratio. The criterion is known to economists and financial theorists by names such as the geometric mean maximizing portfolio strategy, maximizing logarithmic utility, the growth-optimal strategy, the capital growth criterion, etc. 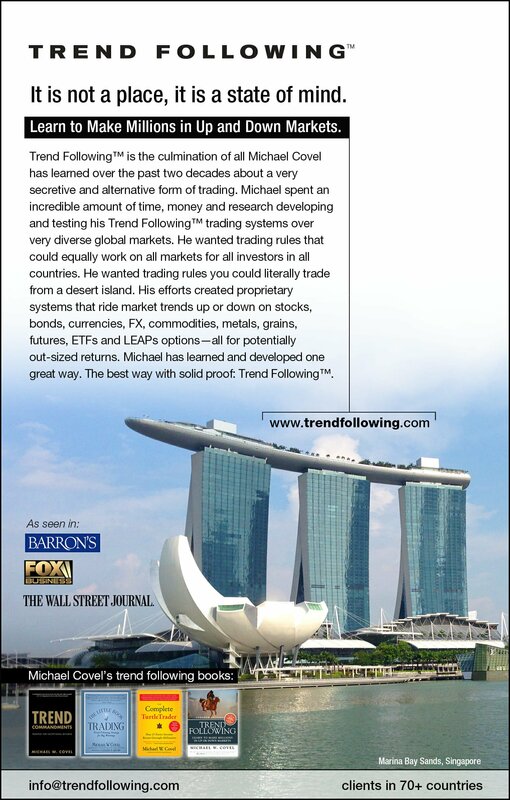 Learn more about the Classic Bestselling TurtleTrader Book.